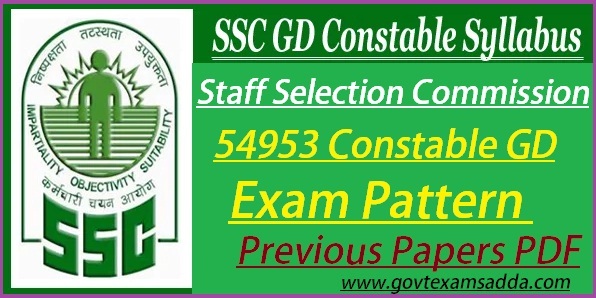 SSC GD Exam 2019 Syllabus:- The Staff Selection Commission has recently released 54953 vacancy for Constable GD. Applicants who are eligible then they can apply SSC GD Constable Online Form on or before the closing date. For the help of aspirants, We have given SSC GD Constable Syllabus & Exam Pattern. So you can check the below given details. We have given below complete GD Constable 2019 Syllabus PDF. Latest Update:- Hello Candidate, The Staff Selection Commission has been announce the SSC GD Exam Date. The SSC GD in CAPFs, NIA, SSF and Rifleman (GD) in Assam Rifles Examination 2018 conduct from 11th Feb to 11th March 2019. The exam authority SSC release the SSC Constable GD Syllabus 2019. Applicants can access the SSC GD Constable Syllabus 2019 Subject Wise. The Staff Selection Commission GD Syllabus Pattern help in the exam of Constable GD. Contenders who are searching SSC GD Constable Exam Pattern and start their exam preparation to crack this exam then they can access their syllabus also. We have provide the SSC Syllabus 2019 GD Constable PDF. We have given various subject syllabus like as General Intelligence & Reasoning, General Knowledge & General Awareness, Elementary Mathematics & English and many more. Aspirants can check the updates of SSC GD Syllabus, Previous Papers also. The Staff Selection Commission (SSC) has been release the SSC GD Constable Syllabus PDF. Aspirants who have applied their form, Now they are download the SSC Constable GD Exam Syllabus 2019 and start their exam preparation to secure selection. The authority releases official update regarding SSC GD Constable Exam Pattern 2019. So stay aware and make continue exam preparation. This exam consist various subject in the SSC GD Constable 2019 Syllabus. We have given below the complete info & syllabus also. The GD Constable will be MCQ Objective Type Question. Applicants have to select one correct answer given four answers (A, B, C, D). The Written Exam consists of MCQ 100 question carrying 100 marks. Time will be allowed 1:30 Hours (90 Minutes). The Exam will be conducted CBT in Hindi & English language. Contenders who are spending time in the study should ensure officially SSC Constable GD Syllabus PDF 2019. We have suggested to you that you must practice the SSC GD Previous Papers & Model Paper also. SSC GD Constable Syllabus 2019 PDF download is already available at official site. If you have any query or suggestion than comment us.